Every week one of our recruitment staff attends Sheffield Futures, Star House, Division Street in Sheffield City Centre. We have our own time slot every Thursday 1pm – 3pm where we get the opportunity to speak to people who are looking to access employment or training in many different occupations including Traineeship, full time learning or work placement. Just call in and see us and we will discuss your individual requirements and will be able to support you to take the next steps in finding the right career for you. We always have current vacancies and can also search for specific opportunities based on your individual needs. For more information call us on 0114 263 6570 or click on the button below to contact us via our online contact form. 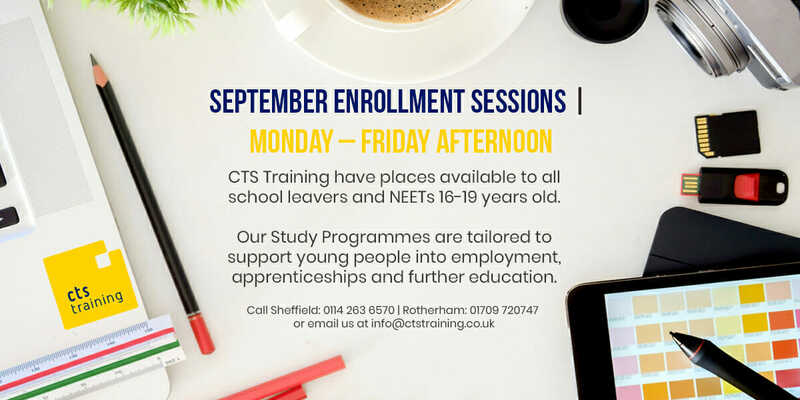 If you are looking for an apprenticeship but not found the right opportunity yet CTS Training can support you into a traineeship where you will be fast tracked into receiving valuable hands on work experience along with gaining valuable qualifications to help get you the right apprenticeship. CTS Training will provide support and guidance throughout your journey. Come along to CTS from 4th September to 8th September between the hours of 3pm and 5pm to find out more and speak to one of our advisers. Our Study Programmes are tailored to support young people into Employment, apprenticeships and further education. Did you get those results…. then great! DO YOU WANT TO HEAR MORE ABOUT OUR EVENTS?